The newest generation of inverting filter centrifuges from HEINKEL convinces with efficiency, user-friendliness and refined design. The F series is particularly suitable for fragile, difficult-to-filter products with a fine crystal structure and which need to achieve a high degree of purity and low residual moisture. Everywhere where difficult-to-filter, high-quality, physiologically active or explosive substances are intensively washed and separated from liquids, inverting filter centrifuges find their use. They have, similar to the peeler centrifuges, a cylindrical perforated bowl which rotates on a horizontal shaft. In difference to the peeler centrifuges, the inverting filter centrifuges guarantee a heel-free discharge. This allows a fully automatic batch process at constant product quality. To improve the performance of their inverting filter centrifuge as well as increase convenience, reliability and economic viability, HEINKEL has further developed the technology. The result: the newest generation of inverting filter centrifuges, the F series, which is characterized by high efficiency, user-friendliness and refined design. 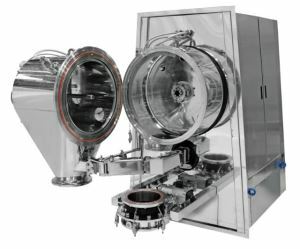 The HEINKEL F-type inverting filter centrifuge ensures a homogeneous cake structure and therefore achieves good dewatering and washing results. This homogeneous cake structure as well as the heel-free discharge enable a thin film filtration with a cake structure of less than 4 mm. This is particularly advantageous in the separation of products with a very fine particle size < 10 μm and high filtration resistance. In addition, the centrifuge bowl can be subjected to a pressure of up to 6 bar. Consequently a reduction of the residual moisture of up to 25 percent compared to conventional centrifugal filtration can be achieved. This significantly improves the product handling with subsequent process steps such as drying, conveying and packaging. For product change or maintenance purposes the F-type inverting filter centrifuge from HEINKEL can be cleaned quickly and effectively without opening the centrifuge housing using the fully automated CIP system. This reduces the risks of product exposure for the operator and protects the product from contamination. An innovative non-contact seal between the filtrate and solid housing ensures zero leakage. Already discharged solids can not be contaminated with the mother liquor. The clear and well thought-out design concept of the centrifuge reduces costs and increases the reliability of the production plant. With the nearly square footprint the machine is easy to insert into existing building structures. An integrated clean room design using a flexible membrane between the process housing and the machine frame, simplifies installation and reduces building and clean room costs. Auxiliary units such as the inerting unit, CIP station and other necessary units are already installed and tested at the factory. This saves assembly time and avoids installation errors. Double hinged doors at the sides of the housing facilitate maintenance and repair work. 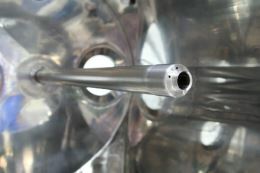 The process chamber is visible through sight glasses in the filter housing, so that the user can check the process at any time.